with a protective clear laminate. Note: All wall surfaces need to be clean, grease-free and smooth. ONLY RECOMMENDED FOR SEMI-GLOSS LATEX PAINTED WALLS due to the type of material we use. IF in doubt of what type of paint is on your walls, please consider our optional mounting idea below. Do not wipe wall with any cleaner containing Melaleuca Oil in them. Do not apply to freshly painted walls (4 week waiting period recommended). Please allow extra production time (5-7 business days) for optimal performance of your wall decal.
. *Optional mounting: We offer a lightweight durable indoor/outdoor material to purchase for any size wall decal called "coroplast." This looks like cardboard but is all plastic and weatherproof. We can add grommets to top for hanging if needed. Please contact us for a quote on material/shipping. If ordering a wall decal with the coroplast, we will mount decal for you at no add'l cost. Use our "Contact Us" page to inquire or send your quote request to us at: Stephanie@allsportdesigns.com. We can add this to your order for you as it is not listed on our website. Your wall decal can than be moved to ANY wall AND be kept FOREVER!! **Idea: Your school mascot on the hood of your car!! Unroll decal from shipping tube. Allow to sit flat for 24 hrs. to decrease chances of curling. Apply only to a clean, smooth wall, metal or glass. Non-porous surfaces ONLY. Do not apply to walls if painted in last 30 days. Allow paint to cure. Semi-gloss latex painted walls ONLY! DO NOT USE FLAT, EGGSHELL, OR SATIN PAINT. DO NOT apply to ceilings! Gravity will eventually pull your decal down. DO NOT apply to floors for permanent use. TEMPORARY use only. DO NOT apply to rough concrete or porous surfaces. DO NOT use any cleaning products on mounting surface with Melaleuca Oil in before applying decal. DO NOT have any lotion on hands when applying. Only clean wall with a damp cloth. Avoid the use of any cleaning product if possible. TO REMOVE: Heat surface with hair dryer. Start at top and pull straight down as you continue to heat sections at a time. Any remaining adhesive can be removed with "Goo Gone". AllSportDesigns.com cannot assume ANY responsibility of how and where wall decals are applied. FOLLOW DIRECTIONS CAREFULLY! Step-By-Step instructional video coming soon!. We offer cut to shape wall decals of your child! These come in various sizes based on your choice/pose. wall window sports spirit decals and stickers.. Football wall window sports spirit decals and stickers.. Soccer wall window sports spirit decals and stickers.. Skating wall window sports spirit decals and stickers.. Cheerleading wall window sports spirit decals and stickers.. Volleyball wall window sports spirit decals and stickers.. Hockey wall window sports spirit decals and stickers.. 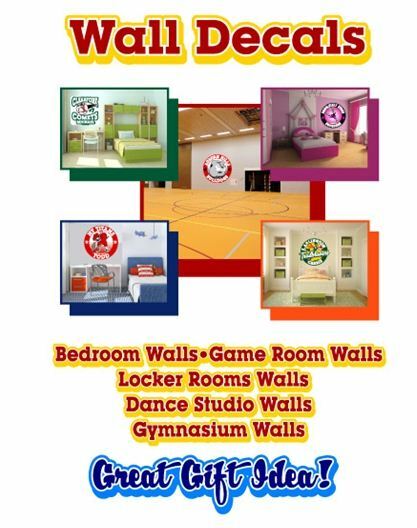 Gymnastics wall window sports spirit decals and stickers.. Basketball wall window sports spirit decals and stickers.. Lacrosse wall window sports spirit decals and stickers.. Baseball wall window sports spirit decals and stickers.. Softball wall window sports spirit decals and stickers.. Swimming wall window sports spirit decals and stickers.. Tennis wall window sports spirit decals and stickers.. Wrestling wall window sports spirit decals and stickers. Dance wall window sports spirit decals and stickers. Field Hockey wall window sports spirit decals and stickers. Drama wall window sports spirit decals and stickers. Music wall window sports spirit decals and stickers. Band wall window sports spirit decals and stickers.